RAIN DID NOT DETER THEM as they came from Camden, Paddington, Randwick, Bundeena, the Willoughby community gardens and the Permaculture Interpretive Garden in Randwick. and saying something about out community gardens. Despite the rainy start to winter visitors toured the community garden. Jan from Manly Vale Community Garden, our hosts, told of how the garden crew is moving into sustainability education by making links with the local primary school and organising two Second Hand Saturday events a year for the swapping of excess personal belongings. These events are now quite widespread. The gardeners have also started Harvest Hub. They obtain organic food from wholesalers which is delivered to the garden where it is packed into individual orders by Hub participants and collected. Most of the food, they say, comes from the Sydney Basin or close by and the Hub is open to the community, not just community garden members. The garden has 50 plots for which members pay $25 every six months, thought the period will soon be extended to a year as this better suits the gardening cycle. About half of the members have plots and there are currently seven available which garden spokesman Dave hopes will be filled following a letterbox drop in the area. Yellowed autumn leaves fall as the seasons give way to winter. A table and seat in the forest garden area for informal socialising. As well as raised gardens made of galvanised iron, there is a broad bed area in which longer term, larger vegetables such as Jerusalum artichoke are grown (there are to be harvested by a school group), and there’s the Secret Garden populated by young fruit trees and shrubs. A trellis along a fenceline supports young citrus being espaliered. The gardeners claimed a discarded Aerobin composter from a footpath during a council bulk rubbish cleanup and this has been placed by the front fence as a community compost. Three other well managed Aerobins form the garden’s compost production system. The newest addition to the site is a greenhouse the construction of which the gardeners found, well, let’s just say, challenging. Council liaison Steve explained how his role and the garden received funding from Community Builders and that a new pathway built to accessibility standards has been finished. Camden is located on the Sydney region’s far south west margin and the community garden is now on the regional Farm Fresh farm gate tour circuit. Council is now looking at a community garden at the town library. Located in a school grounds the garden has made links with the kindy classes there. Landscaper, Chris van Veen said that part of the small orchard area will be replaced with more productive vegetable gardens as the orchard has been less productive than anticipated. The Bundeena garden has been operating for some years now. Raised garden beds and bark chip paths make for minimum maintenance. Assisted to relocate on its present position adjacent to a soccer field by Randwick City Council almost a decade ago, the garden occupies something like a hectare of sandy soil that the gardeners improve through the constant application of compost. To increase compost production, the existing closed plastic domestic type bins and the open compost bays are being supplemented by a number of circular bins formed of hardy wire mesh. Around a meter high and a little over a metre in diameter, the bins aerate well and the mesh is spaced close enough to exclude vermin getting into the bins. Randwick is also part way through construction of an aquaponic system, a process led by the active and organising Jessica Perrini who is also associated with the Assylum Seekers Centre garden in Surry Hills. Emma Daniel represented the Randwick garden and was accompanied by four year old daughter, Josie, who, protected by gumboots, rainjacket and her own umbrella, amused herself in the puddles. Randwick has around 90 members currently, some of whom have their own plot while others manage the shared gardening areas. People come and go, said Emma who has her own small landscaping and horticulture business, Natural Touch Landscapes. A very orderly compost area using Aerobin composters. Rhonda, Willoughby Council’s community garden liaison, explained that there are now three community gardens in the local government area. She is also involved in a school garden. All of these gardens are of recent origin, demonstrating how Sydney’s northside, a latecomer to community gardening, is hosting an increasing number. A councillor from Warringah Council also attended. There’s no mistaking the fact that you are approaching Manly Vale Community Garden as you walk along the street because you encounter a tall pawpaw growing in a footpath garden. There are two footpath gardens raised above pedestrian trip height and set back from the kerb on one side so that people can get into their parked vehicles. They are distanced from the footway on the other side so that overhanging branches do not intrude on pedestrian space. Spaced between mature eucalypt street trees, the small fruit trees and vegetables in the footpath planters form an understory and ground layer to those tall trees much like the stratified vertical structure you would find in bushland—it’s like gardeners following nature’s model. These are spontaneous footpath gardens, community initiatives of the unofficial kind, and as such they provide a fine opportunity to regard them as trial plantings from which, through cooperation and monitoring with the community gardeners, Warringah Council could derive information to enable them to develop an enabling and thoughtful footpath gardening policy and accompanying guidelines. From lawn to food—the community gardener’s raised footpath planter with young fruit tree and vegetables. 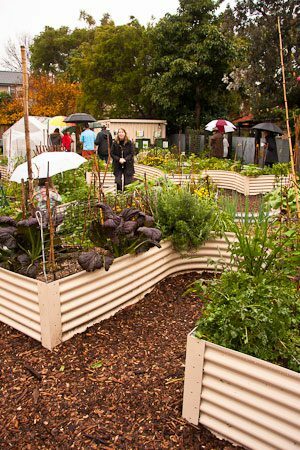 The other reason that I like Manly Vale Community Garden is because it is an example of the type of urban planning that we will need as our denser-populated areas become even more populous. How’s this? The site is multi-purpose combining community garden, children’s playground, passive recreation and shelter with gas barbecues. It remains what local government calls public open space and is open to all—the fence along the street front, with the pepino fruit bushes along its length planted by the community gardeners, is a little over a metre in height and is designed to contain children and keep them off the street. The garden is never locked. The components of the garden include raised, galvanised iron planters for vegetables, a broad bed area for longer term vegetables like Jerusalum artichoke (which are to be harvested by the local school group), a forest garden called the Secret Garden, though not such a secret garden in reality where young fruit trees were doing well, water tanks, a storage shed, a greenhouse and compost production in Aerobins clearly labeled with instructions. The quarterly community garden network meetups were set up as opportunities to share information, know-how and ideas. In doing this they can be seen to be implementing the third ethic of the permaculture design system. This is about enabling people to set up their own support systems by sharing whatever we have in surplus and in doing so to implement the other permaculture ethic of caring for people and natural systems at the same time. Thanks for the Manly Vale Community Garden crew and to meetup participants who braved early winter’s rain to make this a convivial gathering with lots of food to share. A call has been distributed on the community garden network’s Facebook for a host garden for the Spring network gathering. just want to add a correction to a bit of a typo and some more info re camden. Campbelltown council has just finished a round of community consults re the establishment of a community garden between campbelltown library and the southern rail line, this parcel of land is approx 1500m.sq. with a westerly aspect as more news is made available we will let you know. further to Camden news as well as the accessible paths that have gone in several new raised beds have now been installed. Growmax Compost bins are now on site to complement our worm farms. Produce from the gardens has also been donated to the Salvation Army and local service provider Narellan Congregational Community Services over the past 12 months. The past couple of weeks has seen our garden get a mass influx of visitors including groups from Holroyd Garden Club, the local farm gate tour group and over 70 individuals from Asian Women At Work program. Any other groups wanting a guided tour can contact us via 46455022. The gardens are open sunrise to sunset to all. We have approval to start our North Arm Cove Community Garden and are looking for ideas about raised garden beds. We have a community of mostly over 50’s and some young people. Also our soil is highly acidic and very rocky so is not suitable for traditional gardens. If anyone can assist with information about raised garden beds I would appreciate it. I like the ones shown at Manly and Randwick.